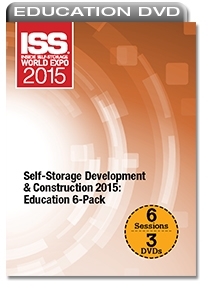 Get six education sessions that address important aspects of self-storage development and construction. This discount bundle offers insight to conversions, modern design, overcoming challenges, and more. Building-Code Updates and How They Affect Your Self-Storage Project- Learn about the various governmental requirements that impact a project, including ADA compliance, energy codes, lighting restrictions and more. Cutting-Edge Design for Contemporary Self-Storage Facilities- Modern self-storage design has become a critical aspect in winning municipal favor. Learn about mixed-use integration, how to beautify conversions, improve the customer experience through design and more. Self-Storage Development and Construction: Avoid These Mistakes- Get tips on how to save money during construction and avoid costly mistakes related to site, office and building design. The Self-Storage Conversion Process: Success Through Existing Buildings- Learn how to evaluate potential sites, avoid common pitfalls and mitigate financial risks during the conversion process. To Build or Not to Build: Decision-Making Factors for Self-Storage- This session provides decision-making insight to location, types of development, construction costs and business goals. Where There’s a Will ... Overcoming Self-Storage Development Obstacles- Learn how to overcome common impediments to project launches, including site selection, the planning process, re-zoning strategies and more.